I finally had some clear weather here last night so I was able to get the LX90 out for awhile..Over the winter I got a new ZWO ASI224 and it's a lot more to learn compared to the Neximage 5 I have been using.. 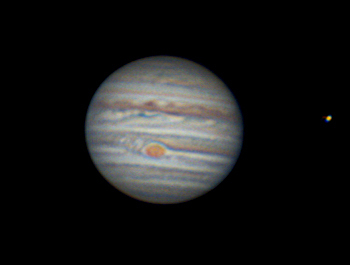 So here is the first image of Jupiter with the ASI224 and the LX90 10" ACF.. This is 112 FPS, 1800 frames, 640x480, 70% stacked in DSS..Seeing wasn't all that great, it was a 7 out of 10.. Personally, I think it is very good, with lots of detail. I do not remember seeing an image showing that many bands. Looking at your image, I can understand now why my visuals have been so confusing. Great shot of the Great Red Spot with turbulence of some sort. Please post any more that you do. We are coming up on a planet season and images will really help visual observers understand what they are seeing. Great shot Spiral and good to hear from you. There is definitely a learning curve with the ZWO cameras. Nice to see you back on this forum and what fantastic photo.